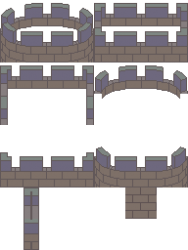 These are the unshaded wall and merlon tiles I used as a base for my LPC castle set. It has a single basic wall tile, curved walls for a round tower and merlons to go on top of the walls. The merlons are in a separate layer for convenience, and they are shaded in different colours compared to the wall tiles to help make it clear how the tiles should be assembled. I don't think these are usable as-is (they need shading/recolouring), but they may be helpful to get started if you want to make your own.